It’s been a massive trend for years to do a themed wedding, but recently in London, a deceased persons family went….one….step….further! Lorna Johnson was just 56 and died of lung cancer , so her family threw her a ‘Halloween funeral’. 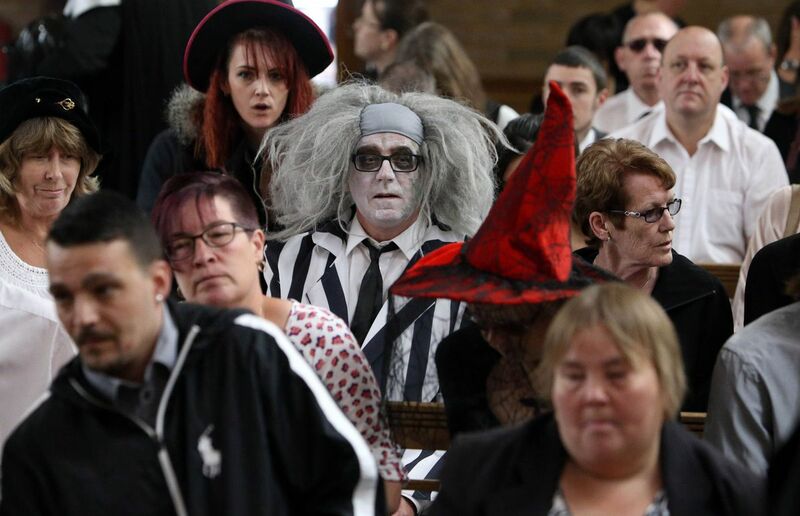 Awesome Idea, after all a funeral is a celebration of life and when we think of celebrations, you sometimes think of dressing up, when you think dressing up, you think fancy dress or Halloween or any number of ‘fun’ things! So let’s pick up the story from The Guardian UK…. LONDON — A Halloween-themed funeral was held in Luton on Wednesday to celebrate the life of a 56-year-old grandmother. Lorna Johnson, who died from lung cancer, was a self-proclaimed White Witch (someone who worships nature and the earth) with a love of Halloween and fancy dress. Her funeral was attended by Beetlejuice, the Tasmanian Devil, and various witches, and the procession was led by Darth Vader. The funeral service was led by Co-op Funeralcare director Brett Houghton, who said they personalise funerals as much as possible to make them unique to the individual. “Lorna’s family wanted today to be a celebration of her life and we’re confident that her personality will shine through,” Houghton said on Wednesday. Neil said his mother would have loved the funeral. “It’s the type of person she was,” he said. “She always wanted a party. So, next time you are arranging a funeral, why not ask the funeral director whether they can do it for your ‘geeky’ loved one. And if you’re getting married, I’d love nothing more to wear my undies on the outside and be a SUPERMAN celebrant! There are 0 comment. on "Themed Weddings! What about Themed Funerals"